Chuck Taylor All Stars are to sneakers what Levi’s are to blue jeans: timeless, durable and all-American. Wherever Lincoln Dickison goes, his chucks go. The only time Dickison isn’t wearing his Converse Chuck Taylor All Stars is when he dons a pair of wingtips for work — and that’s only because he has to. Otherwise, the 27-year-old pledges his allegiance to chucks, which he has worn, and worn out, since the seventh grade. He’s not alone in his cultlike devotion to the utilitarian canvas and rubber sneaker with the distinctive star. Fans say Chuck Taylor All Stars are to sneakers what Levi’s are to blue jeans: timeless, durable and all-American. In Converse’s heyday, the shoes were worn by the likes of Wilt Chamberlain, Larry Bird, Magic Johnson and Julius “Dr. J” Erving, who called the shoes “limousines for the feet” in one commercial. Chamberlain once scored 100 points wearing the flat-soled creations. Today, chucks, available in myriad colors and patterns, continue to survive among a niche market. The former shoe of choice for the NBA and boys in gym class are now more often seen on with-it teens and twentysomethings, punk and indie-rock hipsters and nostalgic baby boomers who grew up with basic black or white chucks. 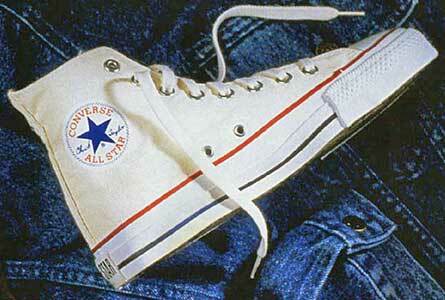 Since the shoe was created in 1917, Converse has sold 575 million pairs. It remains the company’s best-selling product. Despite the shoes’ enduring popularity, however, Converse Inc., has struggled financially for the past several years. After filing for bankruptcy protection in January, it was purchased by Footwear Acquisition Inc. this spring for $117.5 million. Under the restructuring plans, Converse closed its North American factories and announced it was moving production to Asia. Since then, there has been a run on the remaining inventory of Chuck Taylors, as many wearers attempt to purchase the last of the “Made in U.S.A.” shoes. Some say the American-made chucks - named for Chuck Taylor, a semi- pro basketball player and Converse salesman whose signature was added to the ankle patch in 1923 - are on the verge of becoming collectors’ items. The popularity of the rubber-toed sneakers started fading in the 1970s. By the 1980s, athletic shoes were becoming souped-up mini- machines with cushion linings, pumps and gels. Converse couldn’t keep up with the new technologies or the research and development dollars behind them, said Rick Burton, director of the Warsaw Sports Marketing Center at the University of Oregon’s College of Business in Eugene. “Chucks got repositioned from being an athletic shoe to a fashion shoe to a counterculture shoe, and fashion is a tough position for an athletic shoe manufacturer,” Burton said. Converse also found itself tied to manufacturing plants in the United States while competitors were making their products more cheaply overseas. Then there were internal factors, among them a disastrous acquisition of apparel maker Apex One in 1995 that strangled Converse in debt. Converse saw its share of the athletic-shoe market drop from 80 percent to today’s 1 percent.